Thousands of Bangladeshis in London have lost more than £1m after a money transfer firm went into liquidation, BBC London has learned. First Solution Money Transfer Limited, which is based in east London, has 41 branches and more than 100 agents. The firm announced it had gone into liquidation, with directors saying the company grew so fast that they "lost control" of their agents. The company denied impropriety but said about £1.7m has gone "missing". The BBC was told by one agent that up to £30,000 was handed over to the firm by people to be transferred every day. One man, who works in the kitchen at a curry house in Brick Lane, said £500 he sent to his sister for her wedding in Bangladesh went missing. He said: "I sent my money, cash payment, he said (it will reach) in two three days...15 days gone but no money." 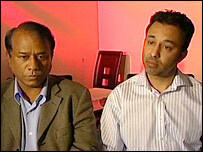 One of the company's directors, Fazal Mahmood, said: "This negative publicity just ruined our life now. We are just running with insecurity. "We are being seen as criminals. We didn't take a single penny from anybody. We want people to know the truth. Its not a loss we just failed to deliver." Ghulam Rumi, another director, said: "Basically the company grew significantly, we grew too fast and we lost control over our agents and thus how the deficit has risen." Directors became aware of the problem three months ago. A statement said the company had grown so quickly they did not have the "appropriate infrastructure" to handle the business. It stressed there was "no impropriety" involved. The firm is now in the hands of insolvency practitioners.